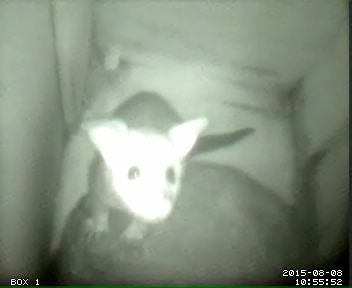 Possum TV: Extra Bonus Baby Possum! 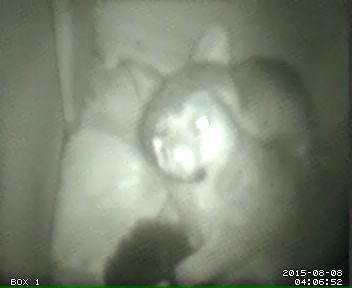 If you have been watching the box cameras today, you might have been confused, because in the last entry I described Kiki's baby as being 'at the "starved frog" stage of development', and yet there was a large and fully furred baby possum frolicking over its mother in Box 1. 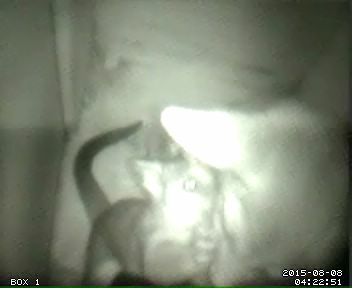 What has happened is that Sasha is using a possum box for the first time, and her baby, which is much further developed than Kiki's, is coming out to play. 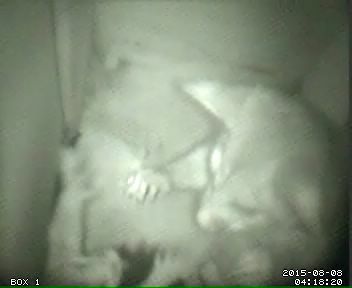 I don't know if Sasha is going to continue to use possum boxes, but now is definitely the time to tune in. 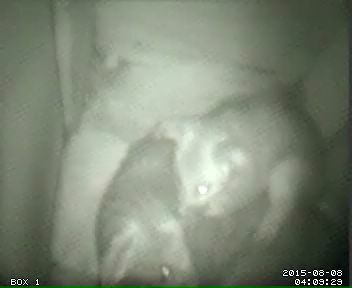 Two mother possums with babies at the same time is a first for Possum TV. Apologies for the poor picture quality. Box 1 camera is older and of a different (and cheaper) type than the others. Both the box and its camera were due for refurbishment, but I won't be touching the box any time soon in case it discourages Sasha from visiting.